Since June 15, the Athletics are 36-12, reminiscent of a tremendous run in 2002 when Oakland blew past the Mariners to win 103 games and the AL West. Deja vu? OAKLAND – It’s been 16 years since their Moneyball season elevated the Oakland A’s, and seven summers since the movie about that summer had Brad Pitt make Billy Beane look cooler than any sports executive ever. The excitement about that 2002 season was somewhat muted up to Aug. 13, when the A’s beat Toronto 5-4. 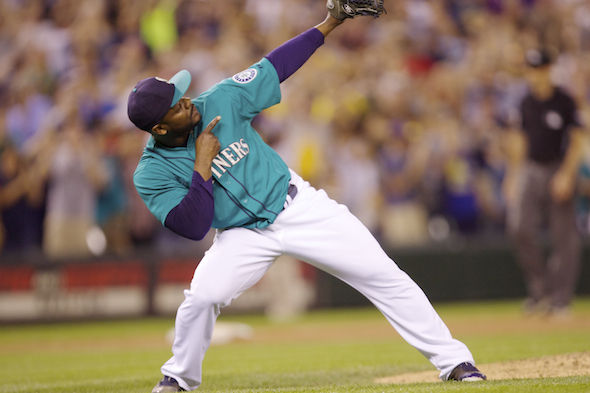 The Mariners, coming off back-to-back AL West titles, had a 72-46 record Aug. 12. They had a 2½-game lead in the division over the Angels and 4½ over the A’s. Seattle was in good shape to make it three in a row. But the win over the Blue Jays was the first of an American League-record 20 consecutive Oakland wins. Centered around a big-name rotation of Tim Hudson, Mark Mulder and Barry Zito and an offense led by Miguel Tejada and Eric Chavez, the A’s blew past the Angels and the Mariners to win the West. The wild-card Angels would get the last laugh by winning the World Series. Seattle hasn’t been to the postseason since. We bring this up because the Mariners, who start a three-game series in Oakland Monday — yes, Aug. 13 — are living through something similar at the hands of the A’s this year, even after the four-game sweep of Houston. On June 15, the A’s lost to the Angels 8-4 to fall to 34-36, 11½ games behind the first-place Astros and 11 games behind the second-place Mariners. Oh, those were the days for Seattle. In the Bay Area, Moneyball has morphed into Pauperball. The A’s come into the series 36-12 since bottoming out. It’s no 20-game winning streak, but playing .750 ball will do for a team that has a major league-low payroll of $66 million. That’s less than the combined $68.5 million being grossed by Seattle’s three highest-paid players – Felix Hernandez ($28 million), Robinson Cano ($24 million) and Kyle Seager ($18.5 million). We know what has happened to Seattle – Cano injured and suspended; Felix demoted to the bullpen; Ichiro retired (sort of); the team batting average, at .261 on June 15, now at .251; and the ERA, at 3.85 on June 15, at 4.52 since. But what has happened with the A’s? It’s not just the statistical improvement, although those changes are something – a 4.05 ERA on June 15 that sits at 3.51 ERA since and a .240 batting average on June 15 that is at .261 since. Since the All-Star break, the A’s have moved into second place in the American League West, 2½ games behind Houston. Seattle is hanging in, four back. As it stands now, it will be either Oakland or Seattle that will make the playoffs as the second wild card team. Oakland in many ways isn’t the same team it was two months ago. Of the original starting rotation of Kendall Graveman, Sean Manaea, Daniel Mengden, Daniel Gossett and Andrew Triggs, only Manaea remains. Graveman, Gossett, projected No. 3 starter Jharel Cotton and the team’s best starting pitching project, A.J. Puk, all had Tommy John surgery. Triggs has forearm issues that likely have him out for the year, and Mengden’s injury issues led to demotion to the minor leagues. Beane, then the GM in 2002 and now the executive VP, said the A’s goal has been to do the best they could to fill gaps after three consecutive losing seasons. The A’s aren’t waiting. And it’s been happening in Oakland. There’s been a wholesale remake of the pitching staff. The A’s in March dipped into their past to sign free-agent starters Trevor Cahill (with the A’s 2009-11) and Brett Anderson (2009-13), picked up Edwin Jackson from the Nationals after Washington cut him loose following 10 relatively successful Triple-A starts, then just last week traded with the Tigers for Mike Fiers. It’s not the greatest rotation, but it doesn’t have to be. It only needs to be competitive, and for seven weeks now, it has been. The offense, the bullpen and – longtime Oakland watchers still gulp a little when this is said – the defense have been more than enough to make up for whatever deficiencies are in the rotation. The players are buying into the roster roulette. In recent weeks the front office 1-2 punch of Beane and GM David Forst have been picking clean other rosters in search of bullpen help. They’ve added two closers, Jeurys Familia from the Mets and former Mariner Fernando Rodney from the Twins, and a durable setup guy in Shawn Kelley (also a former Mariner) from the Nationals. Together with Treinen (5-2, 0.92 ERA, 30 saves) and setup man Lou Trivino (8-2, 1.58, four saves) this group suddenly gives manager Bob Melvin a wall of relief that makes the A’s game less one of seven innings for the starter and more one of only four or five. Beane and Forst can afford to concentrate on pitching because the lineup doesn’t need tweaking. Veterans Jed Lowrie, 34, and Khris Davis, 30, are having exemplary years – Lowrie (.267/.347/.459 with 18 homers) made the All-Star team for the first time and Davis (.258/.332/.563, 34 homers) since the break is in the top five in MLB in homers (13) and RBI (28). Lowrie and Davis haven’t worked alone. Matt Chapman (.275/.362/.499 with 16 homers and 43 walks) is the best defensive third baseman in the league, maybe in the game. He leads MLB in defensive runs saved, 14.0. His counterpart at first base, Matt Olson (.235/.324/.441 with 22 homers and 49 walks) is a Gold Glove candidate as well. Both are on-base machines. The A’s even have a good human interest story. The past winter, Steve Piscotty came to the A’s from the Cardinals not because a deal needed to be made, but because the outfielder, who grew up in the East Bay, wanted to be near his mother. Gretchen Piscotty was suffering from advanced Lou Gehrig’s disease, and the Cardinals graciously made a deal work. So Piscotty was at home with the rest of his family when she died May 7. He’s had 13 homers and 39 RBI in his 75 games since her passing. This team can hit. They are one of six MLB teams with at least 160 homers (Seattle has 136). More than that, Oakland is picking up the pace. The A’s were averaging 1.24 homers per game through June 15. Since then, 1.52. Numbers bear him out. The A’s have come from behind in 19 of 35 wins (eight runs once, six runs once, five runs once, four runs twice, three runs three times, two runs four times and one run seven times). Oakland has scored the winning run in the eighth inning or later 14 times. But mostly, the A’s have blown past the Mariners just like in 2002, this time without the big names, without a 20-game winning streak and without spending like crazy. For Seattle, it’s a cautionary tale. Hum babe!! Just get on base, babe. Walks first, launch angle second. Somehow the A’s are getting walks and home runs.